Got some tempeh but not sure what to make? You'll love these seriously good reuben sandwiches with caramelized onions, tasty sauerkraut, and a tangy Thousand Island Dressing. What's NOT to love? Your main ingedient? 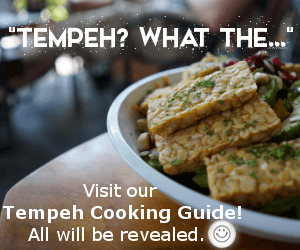 Tempeh, a delectable soy food made from the whole soy bean that is minimally processed. It's also fermented, which is the absolute best way to enjoy your soy! Fermented products are an excellent source of pro-biotics (good bacteria you need). Tempeh is also packed with protein and B vitamins (although is NOT a reliable source of vitamin B12, as we're sometimes led to believe). By the way, ALWAYS buy organic tempeh (and other soy foods -- and corn too!) because most of these crops today are grown with GMO's (Genetically Modified Organisms). Super scary stuff. Learn more here. Sure, you can use seitan (wheat gluten -- buy it at the store or make your own seitan) which comes a little closer to the actual consistency of corned beef, but it's not NEARLY as good for you. 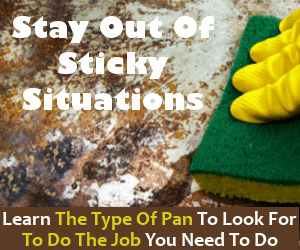 To prepare your tempeh, steam it for 10-15 minutes first and it's ready to be sliced and used in your sandwich. I like to slice it in half both horizontally and vertically to end up with 4 thin slabs. If you have time, quickly brown in 1/4 cup veggie broth or a little swipe of olive oil to up the flavor quotient a bit, although this browning step isn't vital if you're in a rush. What brings this sandwich to the tallest heights are the caramelized onions. OMG! If you've never made caramelized onions before it's SUPER DUPER easy -- but will take you about 15-20 minutes, so you can do this while your tempeh steams. 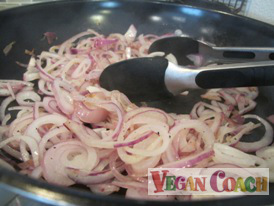 To caramelize your onions: Add 1/4 cup veggie broth (or a swipe of olive oil) to a pan, add thinly sliced onions (to taste), and sprinkle with sea salt. For 2 sandwiches (8 ounces of tempeh) I'll caramelize 1/2 an onion. Cook over medium heat, stirring occasionally, until most of the onions are browned. Of course, a reuben wouldn't be perfection without sauerkraut! 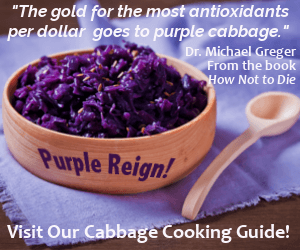 Sauerkraut is also a fermented food, which your body will absolutely love you for. When the onions are ready, simply push them to the side and warm the sauerkraut in the same pan. Mix in a small bowl. That's it! To assemble, place 1 slice of your favorite bread (Rye or Pumpernickel is good, but any ol' bread will be fine), on a plate -- you can toast it first if you prefer. 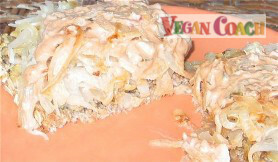 Place 2 slabs of tempeh across bread, cover with sauerkraut and caramelized onions, and dollop with dressing. Repeat. Serves 2. Be sure to serve with a knife and fork. Devour! Today's UNrecipe was brought to you by our good friend Tempeh. Ideas for flavorings in this meal were inspired by its Flavor Matches. By using the information found within the pages of our website, you can create quick and easy meals without recipes. "Last night, I came across your Rueben sandwich recipe while looking for a way to fix the tempeh I had just bought and determined to fix it today. Oh my gosh, the flavors were amazing! This recipe is a keeper and just went into my "FAVs" collection. Thank you!"